According to a recent report by the World Economic Forum (WEF), Arab countries' share of the world's gross domestic product (GDP) in 2017 is the most significant change in the world's largest economies. 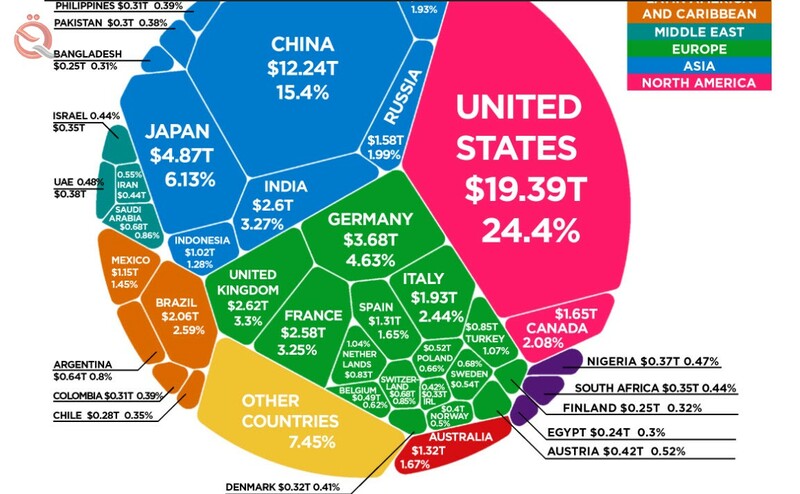 According to the World Economic Forum's World Economic Outlook issued on October 15, according to World Bank estimates, global gross domestic product (GDP) is about $ 80 trillion by 2017. The report pointed out that Saudi Arabia was one of the most prominent changes in terms of participation in GDP during the year before last. The World Economic Forum said that Saudi Arabia jumped to the top of Switzerland, ranking 19th among the world's largest economies. Saudi Arabia's participation in world gross domestic product (GDP) in 2017 was about $ 0.68 trillion, equivalent to 0.86% of world GDP, the report said. The report added that Turkey surpassed the Netherlands to become the 17th largest economy in the world. Brazil, despite its recent economic predicament, surpassed Italy and occupied eighth place, also one of the most important changes in the world economy in 2017. According to the report, the United Arab Emirates contributed about $ 0.38 trillion to the world GDP, representing 0.48% of the global economy. Egypt also participated in the global economy during the previous year with a value of $ 0.24 trillion, equivalent to 0.3% of the world GDP. Globally, the list of the world's top 10 economies, with US $ 19.39 trillion, is equivalent to 24.4% of world GDP.